Like many a speculator, I’ve dabbled in the juniors. Specifically, I’m referring to junior gold and silver explorers and miners. Before 2011 it was a successful endeavor, post 2011, not so much. One of the things I did before altogether stopping the placement of new capital in any juniors was to compile a list of what I deemed to be some of the top opportunities for when precious metals finally make their turn back to positive. For the record, I don’t know when that’s going to be. The gold price languished for 20 years in the 80’s and 90’s. Do I think we’re in that type of 20-year-bear? No, but I don’t have a clue as to when the ship will right itself. I simply believe in the long-term thesis for holding gold, but more importantly, I believe in the cyclicality of the commodity markets and historical precedence. There are any number of arguments in favor of allocating capital into precious metals, but for most speculators, the current price action in gold and silver pretty much tells the entire story. A declining market is not exactly the best moment to deploy new capital into the most riskiest ventures of a loss-leading sector. Thusly, it’s been at least 2 years since I speculated with any capital in a junior. Which brings me to the list. One of the companies I had kept a passive eye on was Duluth Minerals. If you’re unfamiliar with their story, they’re the proud majority-owners of some prime property through a joint venture in the Twin Metals complex in Minnesota. Their land package and joint venture partner was what first attracted me to them. Duluth possesses one of the most promising platinum group metals (“PGM”) resources outside of Africa or Russia. In fact in North America, there’s really only two primary PGM producers of consequence, and they are Stillwater Mining and North American Palladium. So access to a nice PGM resource in a jurisdiction like North America is coveted. However, PGM’s won’t even be the primary metals mined at Twin Metals. It’s primarily a copper and nickel mine. The PGM’s are a just a very nice by-product. 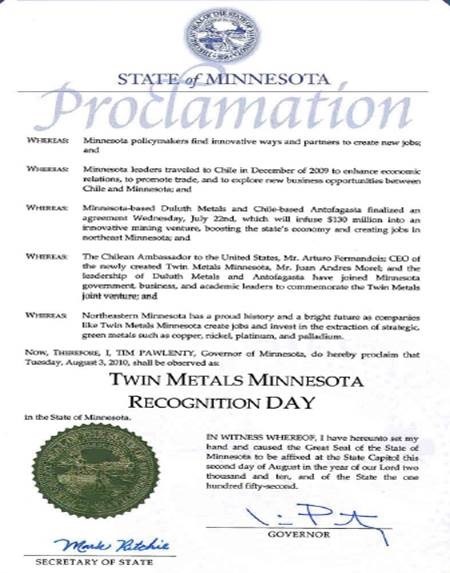 Hence Antofagasta’s interest and investment in Duluth. Just a little background on Antofagasta (“Anto”), they are one of the largest, pure copper players in the world. Based in Chile with 4 operating mines, 90% of the company’s revenues are derived from mining operations. In 2013, they generated approximately $6 billion in revenue which is in line with large US copper player Southern Copper (SCCO) but far below the diversified mining giants such as Vale (VALE), Rio Tinto (RIO), or Freeport-McMoRan (FCX). Before getting to the point of this post, some additional background is in order. So we have a major copper player with concentrated interests in Chile attempting to diversify their portfolio with the Twin Metals joint venture. In 2010, Antofagasta partnered with Duluth and over the next few years provided approximately $220 million in funds in order for Duluth to develop the properties. Duluth completed a ton of drilling to really prove out the potential of Twin Metals. They contracted with Bechtel, one of the largest and most powerful privately owned corporations in the US, to assist with the planning for the build-out of a mine. But by 2014, Duluth had not done enough to build investor sentiment behind their company and access to capital was drying up in light of overall commodity underperformance, let alone precious metals performance. The stock price was badly languishing. Duluth’s cash reserves were drying up fast, and in July, Anto neglected to capitalize on an additional financing round that would have increased their ownership stake in the mine and provide much needed capital for Duluth. Clearly, Anto saw the writing on the wall and knew a better opportunity would avail itself very shortly. One month later in August of this year, Duluth released a highly detailed presser of its Pre-feasibility Study (“PFS”) for the Twin Metals. The PFS was essentially a disaster as expectations were way too large. The stock price, trading at $0.40 a share the day before the PFS release, dropped 25% down to $0.30 a share on the day of the release. I think too many speculators in Duluth thought an outlandish estimate of PGM production was going to be reported, and that was obviously foolish. I sincerely believe that speculators really thought Twin Metals could annually pump out 300k or 400k ounces of PGM’s along with a couple million ounces total of combined silver/gold output. The numbers were very solid, though. Specifically, the report estimated a 30 year mine life with total estimated production of 5.8 billion pounds of copper, 1.2 billion pounds of nickel, 1.5 million ounces of platinum, 4.0 million ounces of palladium, 1.0 million ounces of gold, and 25.2 million ounces of silver. Annually, that breaks down to approximately 88,000 tonnes of copper, 18,000 tonnes of nickel, 50,000 ounces of platinum, 133,000 ounces of palladium, 33,000 ounces of gold, and 840,000 ounces of silver. At spot prices for each of these commodities as of August 20th, that would’ve resulted in approximately $612M in copper revenues, $340M in nickel revenues, $187M in total PGM revenues, and $59M in gold & silver revenues. All product sales would theoretically total about $1.2 billion at those prices if the August 20th spot prices were the average for an operating year. Now I don’t know about you, but for the right price, that’s definitely a resource I’d like to have my hands on. And that’s exactly why Anto did not participate in the July scheduled financing. They figured why bother. They’d already funded over $200M in project development. Duluth management was floundering while swirling the drain of bad finance options. Why not strike at the opportune moment and simply own the entire asset versus partnering in a JV. Just 9 days ago, that’s precisely what happened. This chart, courtesy of Inka Kola News, tells the story via price action. The PFS calculated a net present value of the Twin Metals project at $1.4 billion USD using an 8% discount rate. Anto already owned approximately 10% of Duluth. So Anto already invested approximately $220M into Twin Metals and only has to come up with roughly another $85M(including convertible debt and additional operating funds) to own the asset outright. That’s an absolute steal and congratulations to Anto’s management for deftly structuring the deal in obtaining the buy-in of Duluth’s board and of Wallbridge as well. Now the reason this little sale is a green island in a sea of red is because I was able to perfectly time this trade. I watched the stock languish all year and when I saw that move two Friday’s ago, where Duluth dropped from 12 cents a share to 7 cents a share, I decided it was time to pull the trigger. I maintain a portfolio for my children’s future. It’s reserved for only the best businesses with the best long-term outlook that possess the best brands and continue to raise dividends decade after decade; names like Hershey and McDonalds. However, I thought why not buy a several-thousand block of shares as a little lottery ticket. At $0.07 a share, I simply thought the risk-reward was well justified for my wee ones in light of the quality of the underlying asset. Well, hot damn! From a percentage gain standpoint, this is by far the most I’ve ever earned in a single trade for only holding a single trading day. I won’t annualize it as I’m sure I’ll probably never get this lucky again. Of course, the net income off the trade is minimal in light of the total amount of capital risked, but still it’s a nice little boost for the year to my children’s future. I haven’t actually realized the gain yet as I’m holding for a little currency translation to work in my favor first. Mistake? I don’t think so, as I think Canada will approve the sale of Duluth so I have the $0.38 locked in at today’s Loonie rates. The dollar looks set for a little breather and I suspect that just may translate into the higher liquidation price I’m reaching for. Coming back to Anto and what the future holds for Twin Metals. They’ve admitted they have a long way to go, with their own projections putting production out to 2020 at the earliest and possibly even farther. The next step from the PFS is the Bankable Feasibility Report (“BFS”). It’s this report which will allow Anto to secure financing for the construction of the mine. Actually, they probably won’t even bother. Consider that the pre-fease reported mine construction expenses at $2.8 billion. We know that’s aggressive, so I think it’s safe to arbitrarily add another $400 million onto that total. Conservatively, building the mine is going to cost approximately $3.2 billion. But even with a staggering expense number like that, Anto should have no issues securing financing. When you have a day named after you in a state, I think it’s pretty safe to assume that the state is going to be very cooperative in light of the economic benefits to be garnered. Just remember, you had a chance to own a fractional share in a billion dollar mine for a little over a nickel a share. The junior space is beginning to heat up as quality assets are beginning to be circled. The sharks are starting to get restless as a vast majority of the juniors simply will not be able to obtain sustainable financing in light of their current share prices. We’re talking about companies that simply throw cash down a hole with zero immediate economic return and too much G&A digging into value creation. New Gold snatched up Bayfield to round out its Rainy River package. Nord Gold is positioning on Columbus. Romarco just received all of its final permitting and negotiated a $200M dollar debt package that will allow them to begin construction immediately on their Haile mine. How long before a bidding war starts on their potential 150k ounce per year mine? There’s value to be had and money to be made in the junior space, but it’s highly dangerous and not worth the capital risk for the average investor. I’ve been fortunate on a few junior trades in this terrible gold market with Romarco, Lake Shore, and now Duluth. I could easily replace the word fortunate with lucky, however, I did my homework on those companies. I’ve also screwed the pooch in names like Aurcana, Kaminak, and McEwen Mining with poorly timed purchases. All companies that have very good potential if or when the precious metals resume a bull market. Despite my luck in the Duluth trade, I am a strong proponent of buying the right stocks for long-term holdings. As I stated before, that means companies with mega-brands who produce enormous amounts of free cash flow and consistently raise their dividends. Buying these kinds of companies when they go on sale is essentially a sure-fire bet to building wealth, but a little flyer every now and then is worth the risk.